Thompson SBRs - Auto-Ordnance | Original manufacturer of the world famous "Tommy Gun"
The Thompson short barreled rifle (SBR) is our gun that is closest in dimensions and weight to the original submachine gun made famous during the 1920's in the hands of gangsters and G-men. Its operation is semi-auto, firing from a closed bolt, and featuring a 10.5” barrel. The frame and receiver are machined from solid steel and the stock is genuine American walnut. The finish is blued steel. 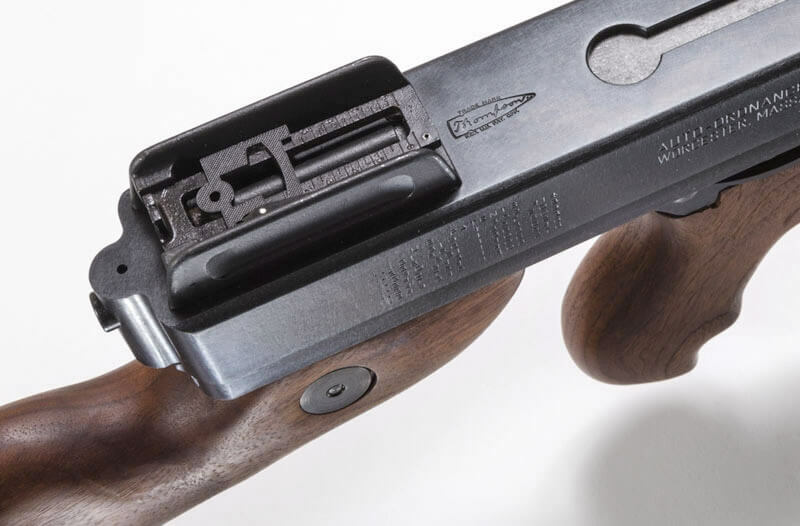 ♦ Note: The Thompson Short Barrel Rifles (SBRs) take 5-6 weeks to process and transfer to dealers. It then takes another 8-9 weeks for the dealer to process and transfer the rifle to an individual. Thompson Short Barrel Rifles must be shipped to a Class 2 manufacturer or Class 3 dealer directly from our factory in Worcester, MA. The transfer paperwork between Kahr Arms/Auto-Ordnance and the dealer (known as a Form 3) must be completed and approved by the NFA branch of the Bureau of Alcohol, Tobacco, and Firearms (BATF), before the Thompson SBR can be shipped to the dealer. The customer needs to pay a $200 transfer fee directly to the BATF. Your local dealer can assist you in this process. 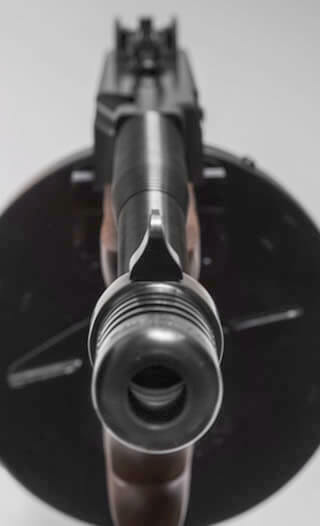 For more information on purchasing an SBR, click on the following link at the BATF web site: https://www.atf.gov/qa-category/national-firearms-act-nfa. Some states do not allow the purchase and transfer of SBRs. Please check the laws in your state regarding ownership of SBRs. A list of Class 2 manufacturers and Class 3 dealers can be found at the following website: www.subguns.com.